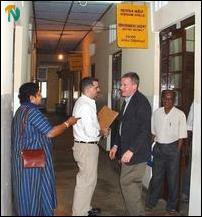 Mr. Dean was accompanied by Mr. Chris Long, an official from the US embassy in Colombo. (R-L)Mr. Dean, Mr. Long and Ms. Rajadurai. The State Department Official, who is on a familiarisation tour, met Additional Government Agent for Jaffna, Ms. Paththiniamma Paul Thilakanayakam, Director of Planning, Mr. P. Sunderampillai and Mr. S. Yoganathan, Relief Rehabilitation Development Officer for Jaffna from the office of the Prime Minister, at the Jaffna District Secretariat in the morning. The Sri Lankan government officials in Jaffna who met Mr. Dean Sunday said they echoed the general concern among the people of Jaffna that Sinhala nationalists and extremists, emboldened by the US military backing, might precipitate another war with the Liberation Tigers. Mr. Dean had responded that the US provides only institutional assistance to the Sri Lanka’s military and that America gives no major arms assistance to Colombo, according to the officials. America is providing Sri Lanka as a sovereign nation to maintain its military balance in the region, the US State Department officer had said, according to Jaffna District Secretariat sources. That India is carefully watching the situation in Sri Lanka does not mean New Delhi would send the Indian army to the island again, Mr. Dean had observed, in response to the concerns expressed at the Jaffna district secretariat meeting about recent comments by Indian government officials. The Jaffna Bishop, Rt. Rev. Thomas Soundranayagam, told Mr. Dean that the people of the peninsula are yet to see the dividends of the peace process, according to church sources. 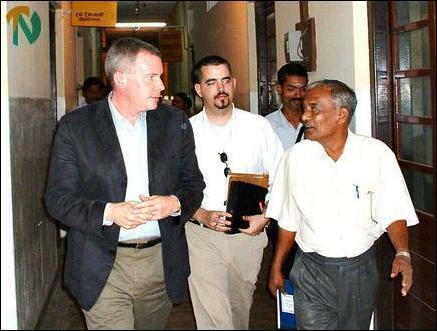 The US team visited the Jaffna public library. The US team refused to let journalists take photos of their visit. Ms. Padmini Rajadurai, a local political assistant at the US embassy in Colombo, told journalists she had firm instructions not to speak to Jaffna media about Mr. Dean’s visit.